The Arctic region experienced second lowest overall sea-ice coverage on record this year, due to the continuing global warming trend, according to a US National Oceanic and Atmospheric Administration (NOAA) report. The report also found that the number of grazing animals in the region, such as the Arctic caribou and wild reindeer populations, dropped by 56 per cent in two decades, with the largest declines in Alaska and Canada. “This report will also help guide NOAA’s priorities in better understanding the role of the Arctic in climate change and extreme weather; sustaining and growing fisheries; and supporting adaptation and economic opportunities in the region,” said Timothy Gallaudet, acting under secretary of commerce for oceans and atmosphere at NOAA. The report shows that the Arctic region experienced the second-warmest air temperatures ever recorded as well as the second-lowest overall sea-ice coverage. 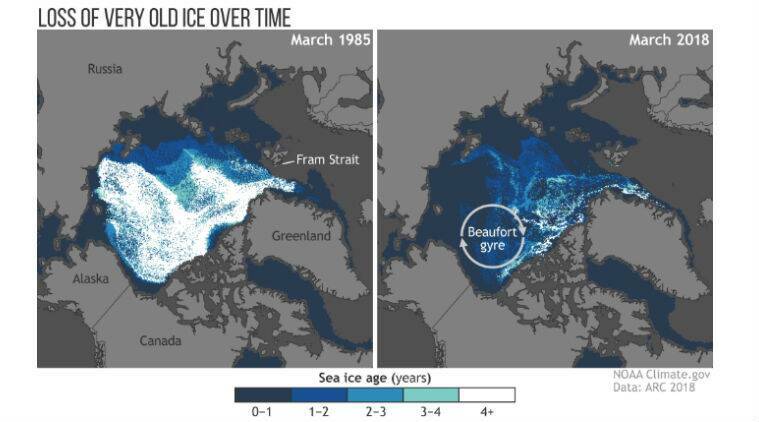 The region also experienced earlier plankton blooms due to early melting of sea ice in the Bering Sea. The report also includes multi-year environmental changes, including a long-term population decline of the region’s iconic wildlife species, the caribou. Other multi-year essays focused on the expansion northward of toxic harmful algae and significant concentrations of microplastic pollution that are transported by ocean currents into the Arctic Ocean from other parts of the global ocean. Arctic caribou and wild reindeer populations dropped sharply from 4.7 million to 2.1 million — a 56 per cent decline – grazing animals in two decades, with the largest declines in Alaska and Canada. Scientists attribute the declines to Arctic warming, which is increasing the frequency of drought, affecting the quality of forage. Longer, warmer summers also increase flies, parasites and disease outbreaks in the herds. 2 Is this the Age of the Chicken?